Recently, Pillsbury sent me a roundup of their "State Fair-inspired" recipes. When I opened the email, I almost clicked my heels in delight: therein was a fantastic collection of recipes ranging from churros on a stick to deep-fried candy bars to pizza cones. OMG! But this one, I simply HAD to share. Cinnamon roll waffle ice cream sandwiches! I mean, seriously. There's no wrong in that recipe, only right. And lots of right. Here's the recipe; for the others mentioned, click on the respective links above. Here are some process shots they sent me, so I don't have to disrupt the flow of the recipe to share them with you. Heat Belgian-style waffle maker. Grease generously with oil. Separate dough into 5 rolls; spoon icing into small resealable food-storage plastic bag, and set aside. With serrated knife, cut each cinnamon roll in half lengthwise; grease both sides of dough with oil, and place 1 or 2 at a time (depending how many fit without touching) on waffle maker. Close waffle maker. Bake 1 1/2 to 2 minutes or until cooked and golden brown. Using wooden kitchen utensil, carefully remove to cooling rack. Repeat with remaining cinnamon roll dough, greasing waffle maker and dough each time. Cool waffles completely. To make sandwiches, with ice cream scoop, add about 1/2 cup ice cream to center of 1 waffle for bottom, and top with another waffle. 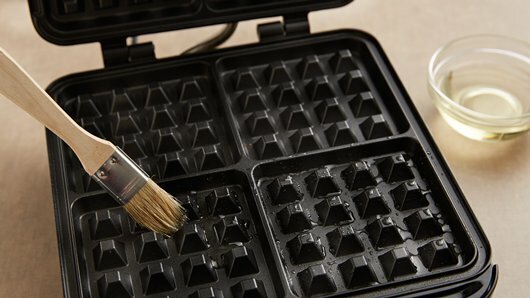 Cut corner of icing bag, and pipe icing on top of each waffle sandwich; sprinkle with powdered sugar and candy sprinkles. Serve immediately, or place in freezer until ready to serve.